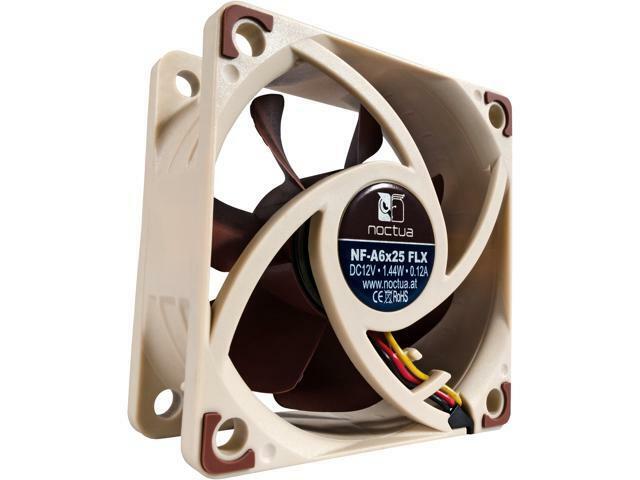 Learn more about the Noctua NF-A6x25 FLX. Pros: I bought these to replace the extremely loud fans on my heatsinks and they work amazing. They are very quiet and provided adapters and extensions with the fan. I would definitely buy Noctua again. Pros: Silent... which would be a pro if this fan actually moved any air what so ever (seriously!). If there is even the slightest obstruction to this fan's flow, ie grates or slots, THIS FAN WILL NOT FUNCTION. What happens is, due to the fact that the gap between the fan blade and interior of its frame is so huge, the fan blades push the air through the blades, and back out through the huge gap previously mentioned. I really have no idea how this fan ever made it past R&D, and I really don't understand how they ever came to the conclusion that they should charge $15 for it. AVOID THIS FAN. EXTREMELY flawed design/ non-functional. Pros: Good fan with good airflow. The LNA adapters are nice. I'm running mine at 1600rpm with the RC12 adapter and I put the RC10 adapter on my case fan. Cons: I took away 1 egg because mine makes a ticking noise. It seems like the blades are barely hitting something. I checked and it's not the wires. Didn't try without the LNA adapter. Other Thoughts: Good quiet fan except for the ticking noise. It's still quieter than my old CPU fan. Also note, this fan is 25mm thick. My old CPU fan was 10mm thick. Pros: I took out the noisy oem fan in the Korg Kronos professional music workstation and replaced it with the JEM.. :) Noctua did it right.. It even has great airflow for a small little fan. Pros: Very quiet, decent airflow, good static pressure. Noise - Don't get me wrong. These are among the quietest fans I've ever used. There are quieter ones, but finding one that is quieter & built this well is exceedingly difficult. I started using Noctua fans roughly 3-4 years ago. At that time I was living in Korea, and noticed that humidity can have quite an impact on noise. After a nice wet summer, all of my Noctua fans started to make a lot more noise (kind of a soft, low grumbling sound) than when new (still fairly quiet, but it was a large difference). Now I am in an arid part of the US, and haven't seen the same issues. Other Thoughts: If these were quite a bit cheaper, I would replace every fan in every system I own with Noctua fans. If you live in a dry area, keep the dust from building up, and you should have a very quiet and reliable fan.